I once overheard a mother speaking to her young daughter as we passed through this station. She was referring, no doubt, to the Greenwood Yard to the south-west, the subway complex servicing the Bloor-Danforth line (The yard is connected to the line by an underground wye junction between Donlands and Greenwood. Ride the train going eastbound from the former, and sit at the front window of the first car; you can see the branch-off about ten seconds after you leave Donlands). But she might well have also been referring to the general atmosphere during the evenings, when a creeping languor overtakes the area. Greenwood station feels very much like a small-town outpost in repose. The decision corridor: east or westbound? For the time being there’s only one entrance — a 2nd exit was planned in 2010, but the TTC utterly botched its community outreach, so the project was deferred with a 2017 timeline. 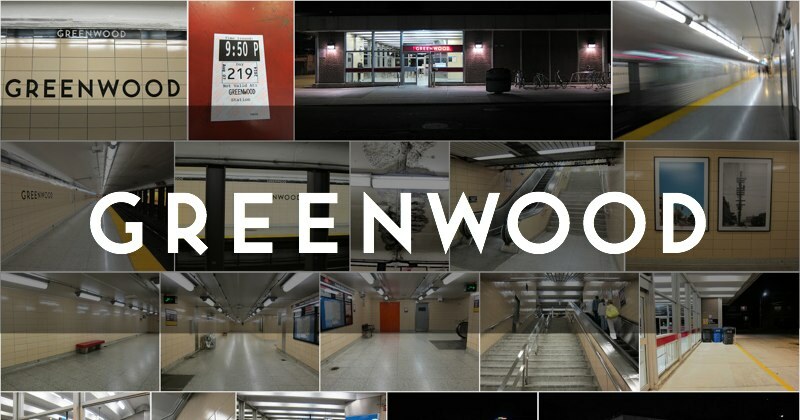 If you happen to visit the station, be aware that it emerges onto Linnsmore Crescent; Greenwood Avenue actually lies another block to the west. The wye structure linking the station to the Greenwood Complex is underneath Greenwood Avenue, preventing an entrance structure there. Greenwood is named for Kate and John Greenwood, who in 1864 opened the Puritan Tavern on the northwest corner of what is now Queen St. and Greenwood. Simple, spartan Greenwood opened as part of the original Bloor-Danforth line in 1966. I’ll wager it’s hardly changed a whit since opening day. Or at least it feels that way.